Wellington, FL – March 16, 2018 - Diane Carney, is the Chef d’ Equipe of Team Telluride, and manages to judge, organize clinics, train and manage her horses and clients at shows in different parts of the country, relying on her capable team and expert horsemen to make it all happen. 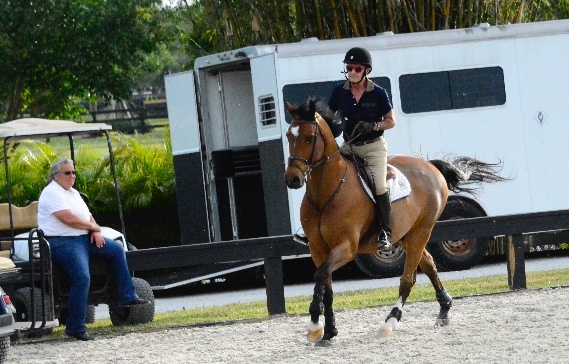 Carney kicked off the 2018 show season back in December when she was the clinic coordinator for the first USHJA Emerging Jumper Rider Gold Star clinics as part of the Athlete Pathway, pulling together two clinics on opposite sides of the country. She handled the logistics for the Gold Star East Clinic at the Jim Brandon Equestrian Center in Wellington, Florida in December and was ready to roll in California in January at the HITS Desert Park facility in Thermal, California for the Gold Star West Clinic. 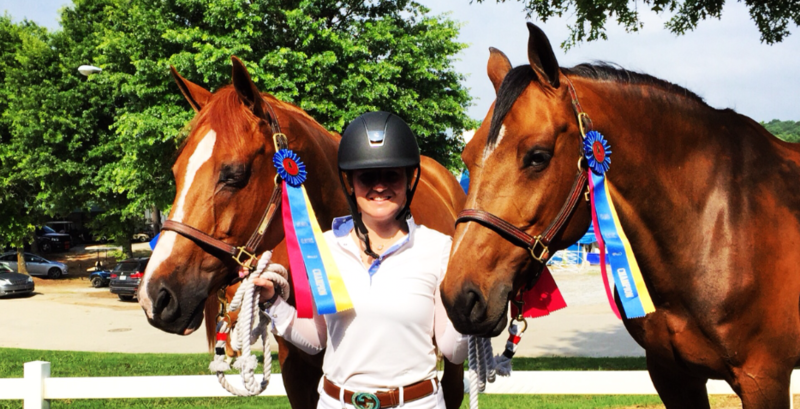 Carney’s 30+ years of experience organizing the seamless George H. Morris Chicago Clinic made her the perfect choice for the job with both USHJA clinics running like clock work. Carney has her client’s horses at Rush Weeden’s Brookwood Farm in Antioch, Illinois and uses professional Serah Vogus of Millcreek Farm from across the street, to ride and school horses when Carney is on the road. Carney and Vogus communicated daily, setting lesson plans and jumping exercises so the horses were ready for the show season before they shipped to Carney in Wellington. 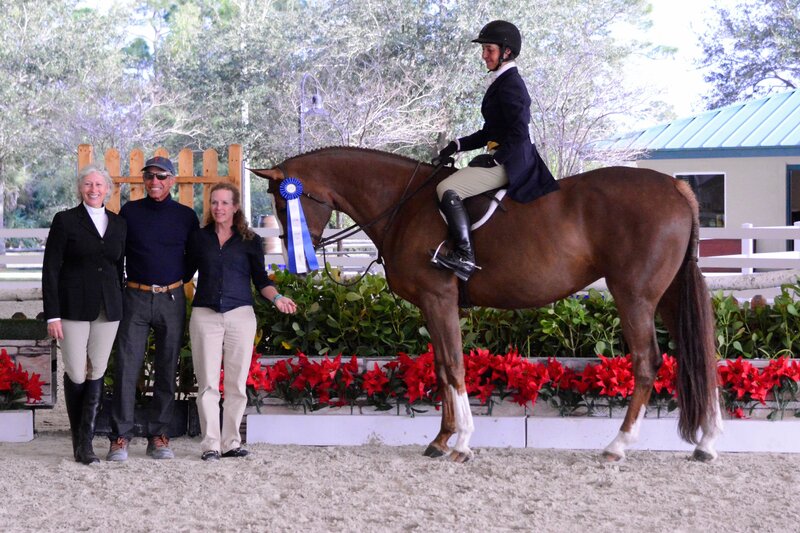 She coached her Telluride clients to successful weeks of showing at the Winter Equestrian Festival (WEF) 3-4 and 6-7. Client Virginia Bartholomay celebrated a USHJA National Hunter Derby win at The Ridge with her hunter, Pancaspe, ridden by Patty Stovel. The ten year old Hanoverian mare topped the judge’s card with an 89 in the first round, then came back in the handy round to hold her lead with another smooth and clever round for the win. At Carney’s request, Stovel has been working with the mare since last fall, with Carney staying in the loop. Pancaspe has won several National Hunter Derbies and collected multiple Championships in the Green Hunter Divisions with sights on the Green Incentive and the HITS $500,000 Hunter Prix. Bartholomay of Bigfork, Montana, earned ribbons in the jumper rings at WEF aboard her jumpers Naturel and Delilah while Debbie Kirsch and Naples Bay, picked up some great ribbons in the 3’ Adult Hunters. Kirsch also purchased Bond 016. The new pair will show in the Adult Hunters, the Adult Equitation and the National Hunter Derbies. Carney manages Bartholomay’s string of jumpers in addition to the ones at Brookwood. Carney has Bartholomay’s Cassanova 30 back with Hunter Holloway, after a successful Spruce Meadows in 2017. Holloway has been working with the imported gelding in the 1.40m jumpers during WEF, putting in double clean rounds in the division. Bartholomay also owns Donnalaris, leased until November to Molly Canfield, who trains with Lorrie Canady at Galway Farm. The pair showed during the Ocala Circuit winning in the High Children’s Jumpers. Donnalaris competed successfully at Spruce Meadows in 2017 with Holloway. 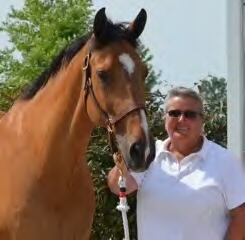 Carney also works with Liz Atkins of Benchmark Stables in Hampshire, Illinois, as a ground person for her jumpers. Carney is often chosen by other professionals for her valuable expertise and ability to get the best jump out of every horse. 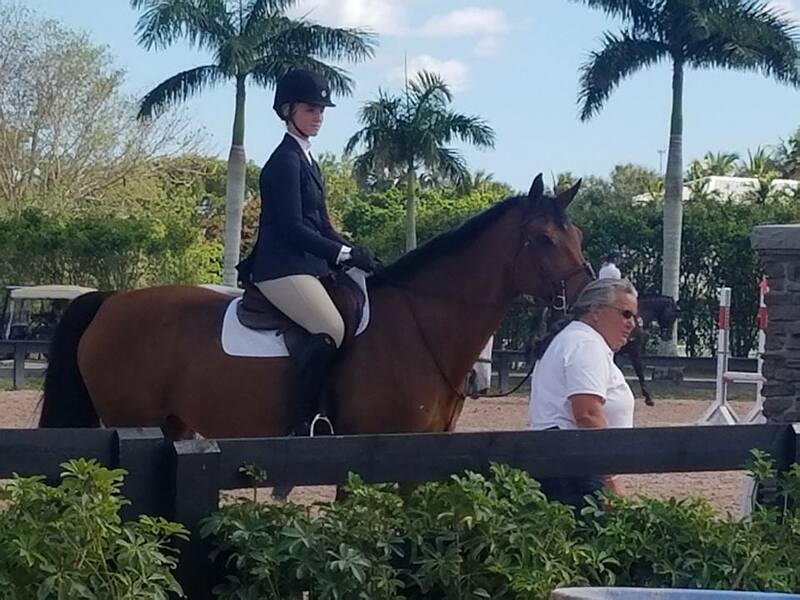 Skyler Hendricks from, Bourbonnais, Illinois, came to WEF for a week to school with Carney, then headed off to the IEA Zone 6 Regionals, where she won both her flat and jumping sections, qualifying her for the Zone 5 Finals in mid-March. Hendricks trains with her mother Andrea at home at their Griffin Gate Farm. 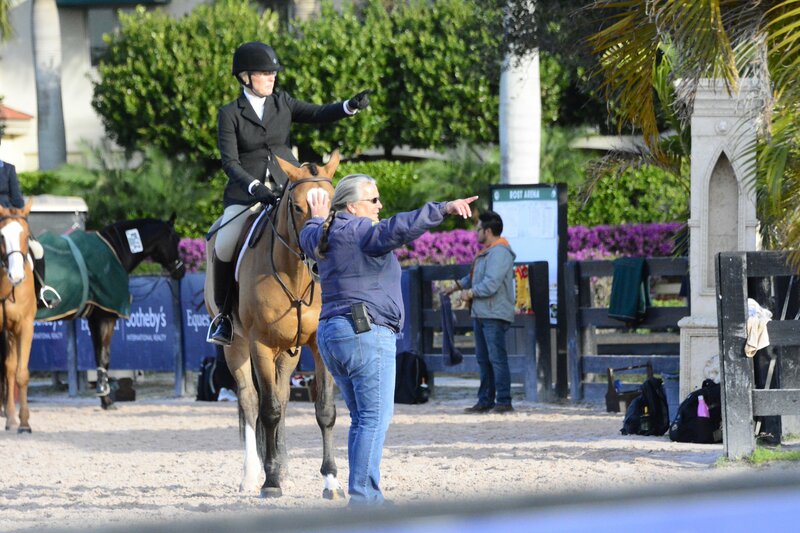 Carney reviews the course with Skyler Hendricks during WEF. Most Tuesday mornings, Carney starts her day with lessons at trainer Wendy Arndt’s Team IEC location in Wellington. Tuesday afternoons, Carney can be found contributing to the course and lending a hand to Rush Weeden, who hosts a George Morris lesson at his farm in Wellington. Small groups of riders take the opportunity to sharpen their skills under the scrutiny of the master of hunt seat riding, fitting education into their show schedules. Over 30 auditors, including, riders, trainers and parents, also show up each week to take in the clinic. Many that started out watching were able to ride in the clinic in following weeks. While Carney was managing Florida, she also organized long time client Caitie Hope to attend the World Equestrian Center (WEC) show in Ohio with her jumper Vision EH. Hope is now an amateur and teaches school in Ohio, making the WEC location an easy option for her to show. Vogus took a load of her own horses and clients to the show and managed Hope’s weekend as well. Both Hope and Vogus have worked with Carney for years and know the care and schooling routine when is comes to showing, managing to take first and second in the 1.25m Amateur Owner Jumpers. Long time client Caitie Hope pictured with her top Amateur Jumpers Total Touch and Vision EH. As the horses took a rest, Carney was one of the R licensed officials for WEF week 5. The first week of March, Carney headed to Auburn University to judge the NCEA teams, then headed to the WCHR week at the Gulf Coast Classic to judge a week there. So how does she do it all so easily? In short, Carney uses a simple program with her horses that can be done consistently and maintains the confidence of both horse and rider, combined with her choice of expert help and good professional to professional communication, Carney is able to keep it all going successfully. Her season continues with judging shows such as WCHR Spring National Hunter Horse Show in Monroe, Washington for Dianne Johnson, IHSA Finals in Harrisburg in May, Thunderbird in Langley, British Columbia and WCE Medal Finals at the Aon/USHJA National Championship, November 13-18 in Las Vegas. Carney plans to take her clients to Balmoral Park and Kentucky this summer to show as well as meeting up with other professionals. 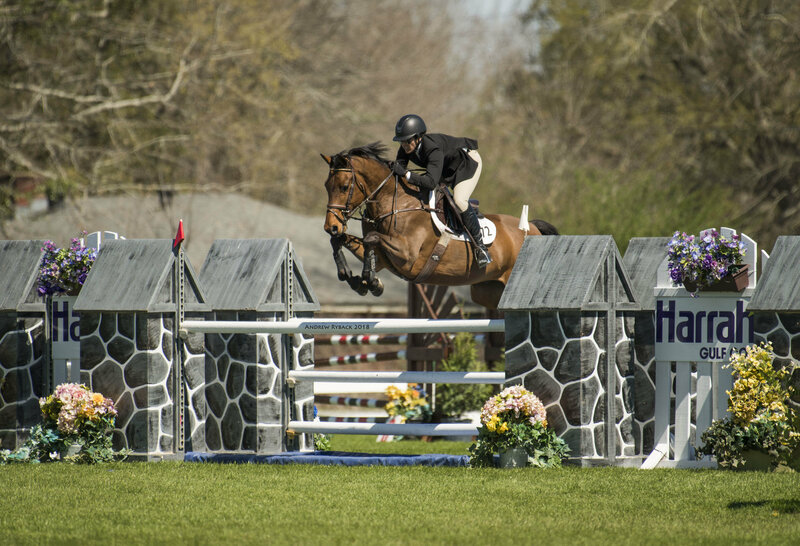 Her clinic schedule includes the Benchmark International Sale Horse Showcase and Jumper Derby May 11-13th and the Galway Farm Classic, September 7-9, featuring both equitation and hunters. Once again, she will organize the George H. Morris Chicago Clinic for Rush Weeden at Brookwood Farm, November 23-25. For a more detailed schedule, visit her website at www.telluridefarm.com. You can contact Diane Carney at 847-922-6167 or dtelluride@aol.com.